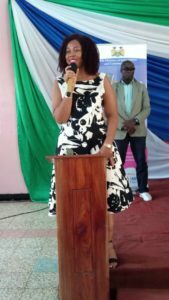 First Lady Fatima Bio has advised pupils to continue using the internet in a responsible manner to educate and empower themselves and not to post unwanted items. According to the First lady, the internet is one big innovation that the world should celebrate, but unfortunately, there were people who use it in a very negative way. “It is the responsibility of parents to know where their daughters are at any time, what they are doing and who their friends are. Our job is to make sure that we protect our kids and advise them to use the internet responsibly because it is a place to empower and educate themselves and not to expose their families and lifestyle,” she said. She was speaking at the Atlantic Hall of the National Stadium during an event to mark this year’s World Safer Internet Day on the theme: “Together for a better internet”. The day has been celebrated since 2004 as a means of raising the awareness of everyone, especially young users in the responsible use of the digital space. First Lady Bio reminded invited guests, especially pupils about the greatest tool the world use today and urged them to be innovative and know how to use the internet. “As we are launching such an important initiative that will be good for you and all of us, please protect yourself, family, community and the nation as a whole when you use the internet. Put out positive things about yourself and family and sell your country in a positive way,” she urged. She added that there were certain children who believe that their parents should not see what were in their phones, neither comment on negative things in it. He said because they take ICT very seriously, they were in the process of reviewing the National Telecommunications Act to solve some of the problems surrounding the safety and security in using the internet. He urged all and sundry to use the internet with respect by putting their reasoning into it before posting anything. “Let us don’t put out things that will hurt others in a negative way. Let us check before we click or post on the internet,” he urged. Managing Director of Sierra Leone Cable Limited, Ishmail Kebbay, said the internet is a place where people achieve their dreams and also accelerate effort to kill it. “We believe in the power of connectivity to support dreams and create pathways that will nurture passion from just an idea to successful businesses. The time has elapsed when the quality of internet and affordability was stifling innovation and debilitating creativity,” he stated.